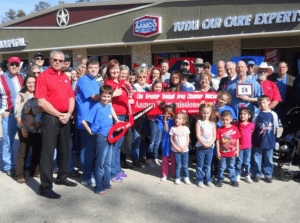 AAMCO Transmissions Tomball recently joined the Greater Tomball Area Chamber and the Chamber hosted a ribbon cutting at the car care center’s grand opening on Jan. 19. Owners, Scott and Bridgette Van Fleet were joined at the event by staff, family, friends and Chamber members. From left are, AAMCO Regional Manager Steve Eulenberg, Christian Van Fleet, Jacob Van Fleet, Bridgette Van Fleet and Scott Van Fleet (holding the GTACC Membership plaque). Lynzie Van Fleet is pictured in front of her father, Scott Van Fleet.